The Dallas moving company you hire is going to charge you per hour, for packing and moving your belongings or they will charge a flat fee. Either way, you might want to consider helping them out with packing for a few reasons. Just to be clear, helping doesn’t mean doing their job for them, but assisting them by letting them know how fragile items are, what you will need immediate access to, etc. Even though you are hiring a moving company, ultimately the items they move are your possessions, so while they are responsible, some of your items are irreplaceable, meaning it’s a good idea to supervise them. Of course, you should let them do their job, but your being there is beneficial to both sides. If you are being charged by the hour, helping them will get the job done faster, and then you can save a little money. Movers charge anywhere from $50-$200 per hour, so even saving an hour can make a big difference in your final bill. Organize everything before hand; when you have everything organized as to how it should be shipped you will save a lot of the mover’s time. Pack the fragile items you care about most; most companies will pack everything for you, but if you can pack the items you are most concerned about, then you won’t have to worry during the move. Be ready when they get there; It’s amazing how often a company will show up, and people aren’t home to let the company in, or they want to be there the whole time but can’t when movers are scheduled. Have a clean house; it is so much easier and time efficient to get the house packed up when everything is clean. You can’t pack a washing machine or dryer if they are currently in use. Get rid of the items you are donating or giving away before the company gets there; this way we don’t pack them into the truck when you aren’t watching. Being courteous to your movers is going to make your move much more pleasant. You don’t have to provide them with drinks or meals, but nicely giving them directives for packing and staying out of the way as they move larger items, or keeping children out of the way will be appreciated by all. Any Dallas moving company will know there are certain things to expect, and that children, dogs, and other things get in the way when moving. But it will make their job faster and easier when you help arrange things before we get there. If you do have any questions before the moving company comes, call them to ask, or if there is anything we can help you with, please call or email, as we are glad to help with any of your moving concerns. Good luck on your move! 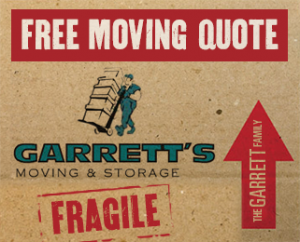 Garrett’s Moving and Storage is a Dallas moving company with over 20 years of experience of moving in Dallas and across the country, and we are BBB accredited so you know your belongings will be in good hands. We also have a best-in-the-industry extended coverage policy. Contact us today at 972-487-5843 for a free estimate or click here to request a quote online from the leading Dallas moving company. This entry was posted in Stress Free Moving Tips and tagged Dallas Moving Company, Moving Tips, Moving to Dallas. Bookmark the permalink.